Dora Budor, Year Without a Summer (Judd), 2017, artificial ash, modified confetti disperser, sound sensor, powder-coating paint, Donald Judd's Wintergarden Bench 16, 1980, dimensions variable. The premise of the summer group show—that the adjacency of works by multiple artists will somehow inform and enhance one’s reading of them—is a slightly tenuous one, occasionally producing exhibitions that rely on superficial similarities. Instead, artist Noah Barker—this show’s curator—emphasizes a diffuse, collaborative mode of production that examines crosscurrents between the works on view, many of which bleed into one another. Centrally placed in the dimly lit gallery (the result of Ghislaine Leung’s gel-filter interventions) is Dora Budor’s Year Without a Summer (Judd), 2017, which features a ceiling-mounted commercial confetti dispenser hacked to distribute artificial ash onto a Judd bench (on loan from a local architectural studio) below it. 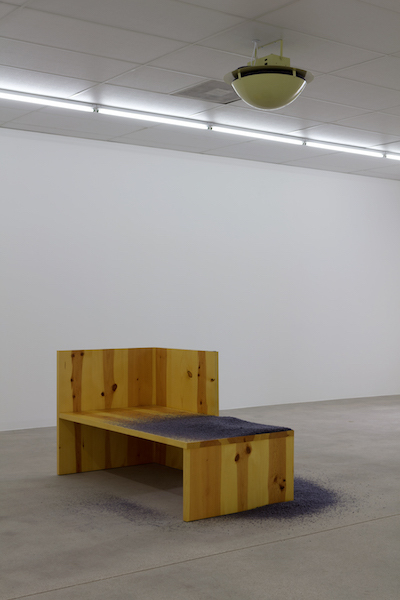 The machine is triggered by ambient sound, including that generated by Hannah Weinberger’s looped audio track of ringtone samples, which wafts from a cell phone hidden above the ceiling tiles; the plastic ash creates a soft, gray halo around the bench. Budor’s ash is also scattered atop the potting soil of Asad Raza’s arboreal Root Sequence. Wald Annex, 2017. Its presence there is both perplexing and sinister: While magma-derived basalt is sometimes used in fertilizer, its synthetic counterpart seems more like a blight than a boon to the work’s two potted trees. These, an Appalachian redbud and a Texas everbearing fig, a small wooden Buddha resting against the latter’s trunk, were chosen for their provenance—they are native to the Dallas area and are well suited to the conditions of gallerist James Cope’s backyard, where the trees will be planted following the exhibition. These living readymades provide an eloquent reminder of the interdependence and circularity that define ecosystems, artistic included.